It has been clear for quite a while now that businesses need to play a larger role in society. The economic crisis of 2008, a result of the systematic corporate-political nexus that grew stronger with time and isolated the broader society, has only pointed to the urgency of the needed shift. 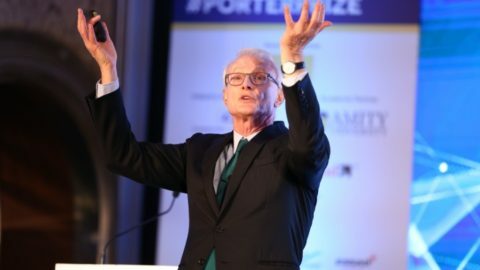 Incidentally, as Michael Porter explains, it is also in the best interests of companies to have prospering communities around them. Successful communities not only create the needed demand, but also provide “critical public assets and a supportive environment”. He believes that the solution lies in the principle of ‘shared value’, which involves creating economic value while simultaneously creating value for society by addressing its needs and challenges. 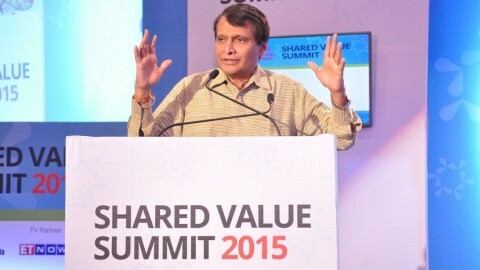 It is in this spirit that the Shared Value Initiative India organises the annual Shared Value Summit, where it brings together thinkers and leaders from the business community to share and discuss strategies of integrating social and economic goals. 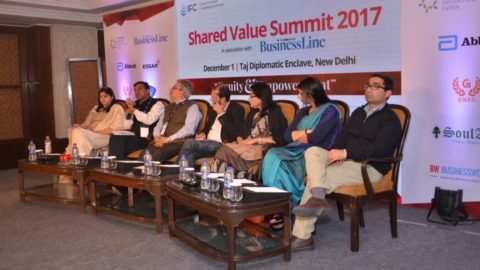 The Shared Value Summit 2016 was held on November 18 with an aim to present an interactive learning platform for discussion about the opportunities and challenges involved in building business models that have a shared value dimension. The day began with an inaugural address by Bibek Debroy, Member of NITI Aayog, who shared his views on development and governance in India. Citing examples from history, he explained that broader participation from citizens is always needed for governance to improve. For instance, the Consumer Protection Act 1986 was an outcome of repeated demands from NGOs and civil society. Likewise, even though it is the job of NITI Aayog to improve entrepreneurship throughout India, the government cannot do it alone. An inclusive approach involving all stakeholders is needed if the business environment in India has to change. Justin Bakule, Executive Director of Shared Value Initiative, followed up these arguments with a strong message to a roomful of business leaders that they had a huge opportunity of taking up leadership and bringing about social change in uncertain times of a global move against globalisation as evidenced by votes for Brexit and Trump. He argued that lack of partnerships and collaborations among companies and strategic planning within them to target social issues that intersect with their business are major barriers to adoption of shared value. Panel discussions throughout the day saw business leaders from across different industries share their experiences in addressing diverse social issues with innovative business models. Among others, Nagarajan from Mother Dairy described how the company’s efforts at institution building of its suppliers has resulted in creation of profitable spin-offs. Himanshu Jain of Sealed Air explained how his company has benefitted by reconceiving the cleaning industry with advanced cleaning methods and training people in them along with giving them guaranteed employment. Faith Gonsalves talked about how Music Basti is using music as a tool to encourage creativity among children while Prerna Mukharya shared her story about creating social impact with data through her organisation, OUTLINE India. A unique panel of young entrepreneurs also shared their experiences on bringing about social change with their respective ventures. Aditi Parekh, who is 17 years old, feels that the education system is at the root of all social and economic ills and is encouraging civic engagement among students across the country with Student Think Tank of India. Shanti Murmu described her efforts against gender equality in Odisha with her project, Parivartan. Pritish Bhavnani is building self-help groups in schools to counter bullying while Priya Radhakrishnan is fostering creative arts among people with Jazba. On a similar note, Anil k. Gupta from IIM Ahmedabad pointed out that creative communities and hungry corporations drive the world. He expressed surprise over the fact that Indian companies have grown less hungry for frugal innovation with time in contrast to major MNCs. He appealed companies to map unmet needs and look for innovative ways to address them. It is time to give innovators the needed voice, visibility and velocity. Nobel Laureate Muhammad Yunus followed up Prof. Gupta’s remarks with examples of his efforts on transforming the Bangladesh landscape with his innovative models of social entrepreneurship and pointed out how profitable business models are a more sustainable solution to societal issues than philanthropy or CSR. Finally, a panel discussion led by David Wilcox of ReachScale on scalability of social business models brought out some interesting views on the subject. David urged the audience to try and achieve the scale of social impact Sam Pitroda had managed when he revolutionised the Indian telecom sector. He felt that Indian corporates had missed a huge opportunity by passing on their CSR activities to a separate department and not scaling them into profitable social ventures. Adarsh Kataruka from SoulAce, however, clarified with the example of SEWA that scale is a challenge on the ground level and needs to be customised for different geographies and circumstances. Ashwin Naik, founder of Vaatsalya, concurred with Mr. Kataruka by adding that impact can be achieved without scale, alluding to the impact MSMEs have on employment as opposed to the formal sector. Such diverse set of viewpoints from the corporates, social entrepreneurs and the government were peppered throughout the summit. However, there was a general consensus among all stakeholders that partnerships and collaborations are the key to addressing social issues while generating economic returns at the same time. Shared Value Summit aims to foster these very partnerships by providing a common platform for stakeholders involved to come together and build fruitful relationships. As Deirdre White from PYXERA Global put it, “Organisations don’t develop relationships, people do”. Excerpts from this article were published in the Hindu Business Line. Click here to read the column.